I slept in on Monday, then packed my things and took the train down to the city. Unfortunately, the closest station to my hostel was over half an hour’s walk carrying an awkward duffel bag…next time, I’m definitely bringing a backpack. So I went exploring, city map in hand. 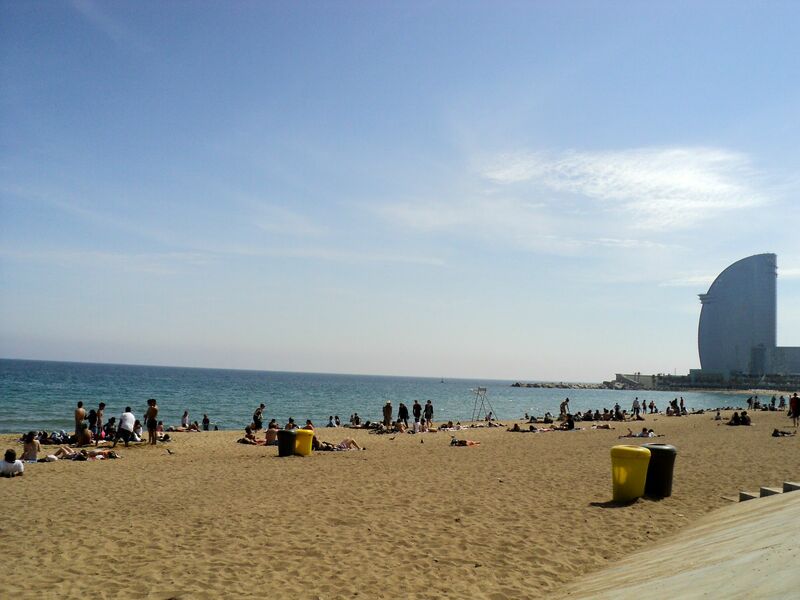 As you heard already, I ended up at the beach, where I took a long nap, getting slightly sunburned in the process. 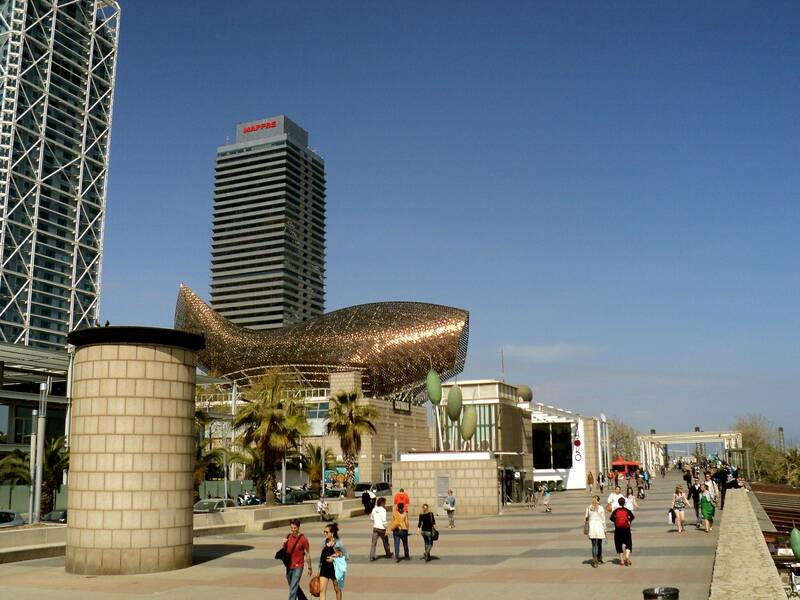 I also walked along the seashore and visited Frank Gehry’s giant copper fish sculpture. It was a warm day, and everyone was outdoors enjoying the weather imported directly from Africa. 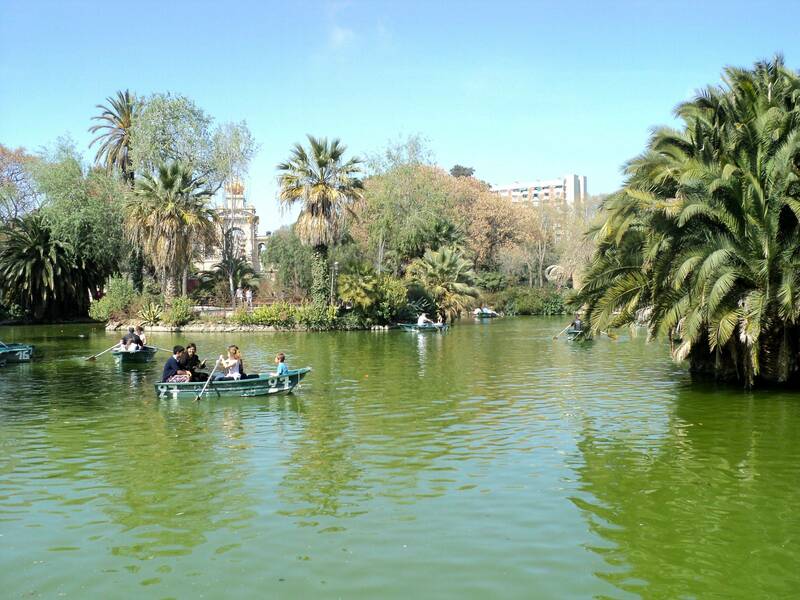 From there I turned inland to visit the Parc de la Ciutadella, a big open space where a hated military fortress was built and later razed by Barcelonans. It’s now a really pretty place. In the background there you can see the golden chariot on top of the Cascada, a massive fountain that a young Gaudí helped design. 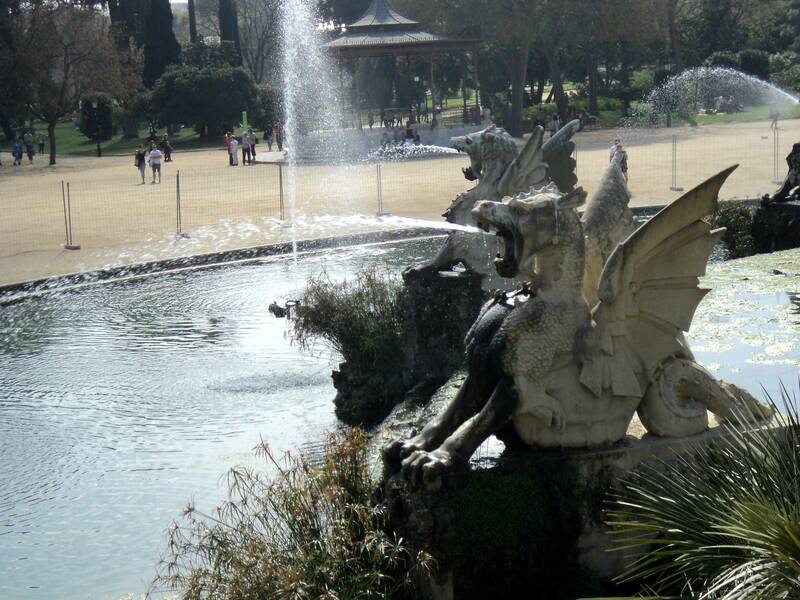 There are also giant dragon monsters that spit water into the pools below. That evening, I went out for Senegalese food in El Born, a fancy district just across the street from my hostel. It was incredibly spicy, a nice change from Hungarian food. Amalia arrived late that night, after exciting adventures with the French air strike (no air-traffic controllers means no airplanes in French airspace means late planes). The next morning we got up, got excellent coffee for breakfast, and went sightseeing in the rain. And oh man did it rain. I was really really glad to have brought my superlight rain coat–Amalia just ended up buying a little umbrella from the street vendors. We walked through most of the Barri Gotic taking shelter in several lovely churches when the rain got too bad. We wandered down La Rambla, the big pedestrian mall that divides the Barri Gotic from El Raval. It was actually pretty nice, since that street is normally impossibly crowded–the rain cleared it out a bit. We even went into one of the big markets and wandered around looking at sheep heads and skinned rabbits and candied fruit. Good times were had all around. 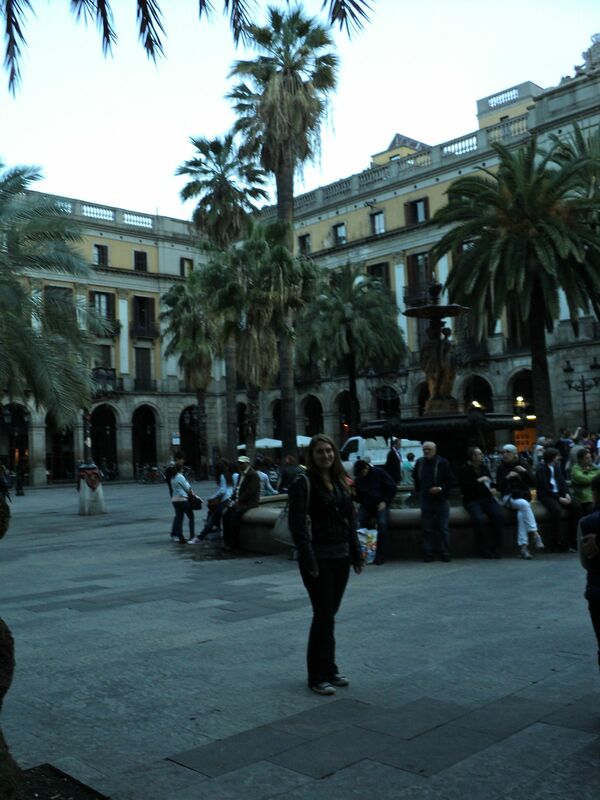 Here’s Amalia in the Placa Real, along with most of the rest of the tourists in Barcelona, apparently. It was a pretty excellent day, especially once the rain stopped. Love the water-spitting dragons! You certainly made the most of your time in Spain. My favorite was the picture of Amalia – as we see & hear so little from her these days! I know, all justified and perfect. Still – Thanks for posting! Also love the Gold Fish! Great photos & text! There’s also a lovely photo of her at this tiny coffee bar where we got cappuccinos the first day in the attached album. It was a good start to the morning. Ariana, I love your pix. Especially the comment on plastic cow balconies. So post-modern. Thanks for the travelogue. It has been a wonderful spring. You made me chuckle aloud with the cow photo placement. Herp a derp derp. What is it like traveling to Barcelona after all this time in Hungary? Has any of your Spanish remained with you? And perhaps most importantly, are you consuming enough Spanish food? My souveniers from this trip: a giant bar of hot-chocolate chocolate, and a large jar of dulce de leche to share with my roommates. Spanish food is great. And yes, I remember the most useful bits of Spanish, meaning the preterite escapes me in conversation… Sigh.